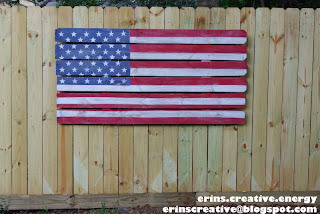 Erin's Creative Energy: Happy Memorial Day! I hope everyone has been enjoying a long weekend and have at least thought about all of our brave service men and women at least once. In honor of their patriotism, I will reshare one of my favorite projects that I have done and one of my most popular ones. If anyone has completed this project...I would LOVE to see it. If you want to recreate this, follow the link above for a tutorial.